T’is the season for pumpkin-everything and you know how much I love pumpkin. Let’s make some Apple Cherry Chicken with my mom’s potato-bottomed rice, for a refreshing change that still echoes the season. Hopefully by now, you’ve tasted maple pumpkin pie or painted a batch of sparkly ones to decorate your holiday table. For those of you who aren’t so pumpkin-crazed, Fall can be a bit daunting. Plump, round orangey things everywhere you look…Real ones, fake ones, wooden, straw or twig ones. Even your faithful ol’ latte gets a pumpkin-spiced makeover. It’s easy to go on pumpkin-overload. This one’s just for you. 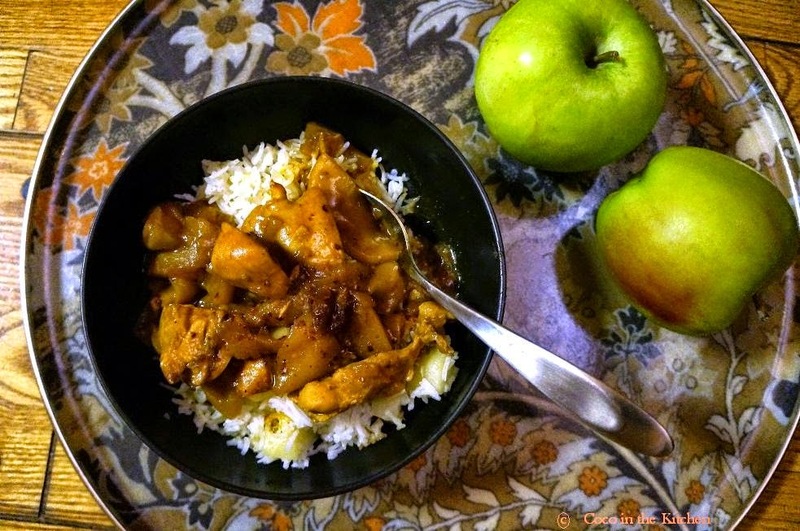 A classic from the Persian kitchen that tastes even better the next day, this unusual stew works magic with seasonal apples, coating fluffy basmati rice in every irresistible spoonful. Cherries are not in the traditional recipe, but add just the right juicy POP! of sweet-tart flavor. Persian moms will shake their heads at my suggestion to finish with Aleppo pepper, but I’m confident they’ll forgive me once they see how it lends a raisin-sweet kick to the stew. Originating from its namesake city, Aleppo is a unique pepper with a rich, red color and sweetness akin to Ancho chilies, but with more bite. Look for it at grocery stores in your Armenian or Arabic neighborhoods. If you can’t find it, just add a small dash of the usual crushed red pepper. When I was pregnant with Daisy and we were deciding on a name for her, I secretly wanted to call her Saff ron. Reputed to be the most expensive spice in the world, its sweet, distinct flavour is the signature of many Eastern dishes, both savoury and sweet.Lucky for us, good quality saffron is widely available. Check your local Trader Joe’s for the little glass vial of the Spanish variety. The secret to unlocking the delicious flavour packed in those delicate crimson threads is a simple technique courtesy of Mom. Grind the threads with a bit of sugar, then steep them in a bit of hot water as you do tea. This infuses both the taste and colour of the fragrant oils into the dish. Cooking on a weeknight can be stressful. If you’re like me, you want your family to enjoy something nutritious, but getting ready in time for dinner can be a challenge. Don’t panic if you’re short on time. This Apple Cherry Chicken comes together in about 20 minutes, because while the chicken in cooking, you’re making the rice. Then while the rice is cooking, you’re finishing off the stew. Get the stew done the night before and all you have to do is make the rice, heat up the stew and serve. It freezes nicely, too. This saucy li’l number is just what you need to feed the troops presto-pronto! Anything Mom makes is delicious, but her rice is especially famous. She par-cooks the Basmatic rice in salted water, then draining off the extra liquid to allow the rice to steam to a finish. The best part is hidden at the bottom of the pot….Crunchy, buttery, salty chunks of potatoes. Cut into small cubes, the potatoes do not take long to cook, because the rice above creates an insulation, trapping the heat around them. Notes: Cooking the rice is probably the most time-consuming step here. Using a frying pan instead of a deep pot gets the rice ready quickly and makes room for more potatoes, which really are the best part. With a few changes, this one is a snap to make Paleo. Put the kettle on and heat up some water. Fill a big pot with water, salt & pepper and half of an onion. Trim the excess fat from the chicken and add to the pot. water. Remove chicken, cut into bite-sized chunks, set aside. Reserve stock to cook rice.Rinse rice until water becomes clear. Add rice to pot of chicken stock and cover with lid. Cook on gentle heat until all the stock has been absorbed, maybe 15 minutes.Meanwhile, use a mortar + pestle to grind a 1/2 teaspoon of saffron threads with a bit of sugar. Then pour a couple of tablespoons of hot water. Allow the saffron to steep like tea for a few minutes. Chop onion and fry in a pan on medium-high heat with a bit of olive oil, salt & pepper. Mince and add garlic.Keep an eye on the garlic as it can burn quickly. Peel and chop apples, add to pan. pomegranate molasses, brown sugar, tomato paste and saffron. Lower the heat, add a cup of hot water from the kettle. Mix gently, cover and simmer. Transfer par-cooked rice to a big bowl. Peel and chop potatoes into bite-sized cubed. Toss in olive oil, salt & pepper. Drizzle a couple tablespoons of olive oil into a frying pan. Arrange potato bits in a single layer. set on low heat and allow the rice to finish cooking, another 20 minutes. Remove frying pan lid, place a large heatproof platter over the pan. VERY CAREFULLY, using oven mitts to protect your hands, flip the rice onto the platter. In the interest of safety, this dangerous acrobatic step can be skipped altogether. 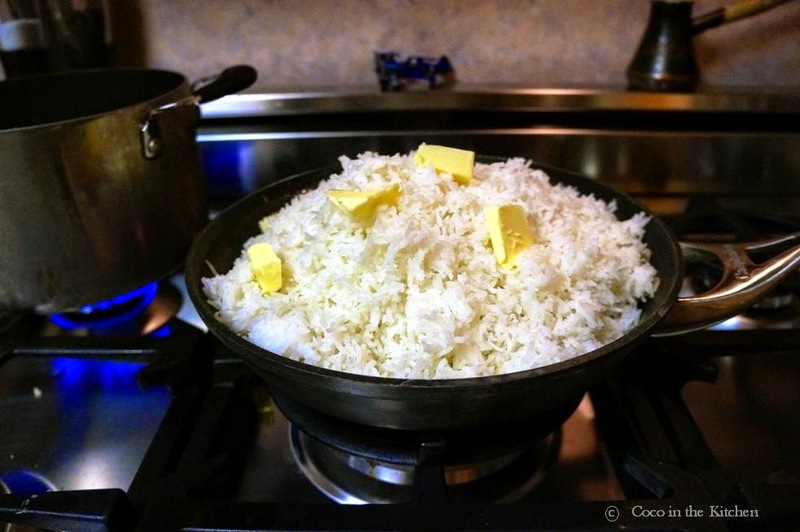 There’s no shame in serving the rice right from the frying pan in a rustic fashion. Rustic translates to cozy. Who doesn’t like that? Transfer stew to a heatproof pasta bowl and serve with a sprinkling of dried Aleppo pepper. Temperatures are dropping and the days are growing shorter. Leaves are changing color and floating gently to the ground. Dinner should be warm and comforting, something homey that reminds you of Mom’s cooking. Shake things up with some fresh flavors with this Apple Cherry Chicken. A delightful Persian classic, it’s a quick healthy dish perfect for a Fall weeknight. treat yourself to this delicious dish. That touch of saffron is sure to make you feel like royalty right at home. I don't like fall and winter, the short days make me sad. I live for the sun! I do love Persian cuisine though! This is a gorgeous recipe and I love the color from the saffron. The potato bottom rice is so unique. Can't wait to give this a try. Grazia! Thanks for stopping by so I could find you. Well, I really can't blame you, doll. You get real weather on the East. We get “pseudo-seasons” here. Hope you try this dish. It's so easy and just so lovely. Thanks, Amy. Glad you stopped by so I could “meet” you. Colette, the Potato-Bottomed Rice is a completely new dish for me – never heard of it but is sounds very interesting and just perefect alongside this unusual Apple-Cherry-Chicken – what a wonderful treat after a long day. I love the combination of ingredients in your recipe – it all sounds amazing, dear Colette! Hope you are doing well! Have a great Wednesday! Bread (lavash or pita), potatoes, or the rice itself is left to develop into an irresistible crrrrunch! Hi, Carly. I think this would be gorgeous with some quinoa, actually. Mmmmmm! this dish is right up my alley! SO delicious and gorgeously pretty with the saffron – LOVE this! Thanks, Kumar. Let me know how you like it! Awww, thanks, Mary. Hope you try it. Please let me know how it turns out. This is definitely my kind of food. Love rice and this chicken is so unique and I am sure it tastes ridiculously yummy. All the flavors are just wonderful, the saffron, wow. I love all your inspiring pumpkin posts! You had me at pomegranate molasses. But saffron would also do the trick. Your dish sounds delicious with all the warm spices. Happy Holidays! 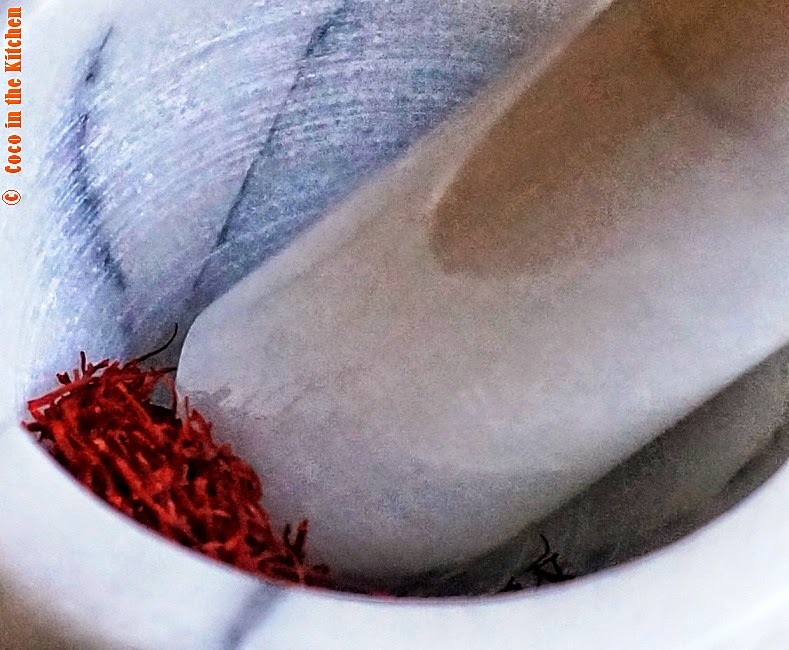 I need to indulge in buying saffron more–I really do. Yum yum! Very interesting & flavorful recipes, apple cherry chicken sounds like a unique combination. Happy Holidays to you, too! Hope you make it! It's a lovely dish. Hope you try it.